Matthew Gibney Catholic Primary School was opened in 1991 to meet the growing needs for Catholic Primary Education within the Eastern Region of Perth. Deacon Mark Powell (2014 – ). The school was built in several stages from 1990 to 1999, catering for students from Kindergarten to Year 7. The extension to the Library, which now houses our Digital Technologies Lab, and the spacious Undercover Area were completed in 2010. These additions were part of the ‘Building the Education Revolution’, with monies coming from the Federal Government. In 2008 Pre-Kindy (3 year old) classes commenced. 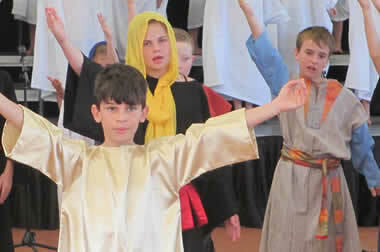 Year 7 classes across the Diocese moved to local Catholic High Schools in 2010, and Matthew Gibney became a K-6 school. The school celebrated its 25th Anniversary in 2016, in partnership with the 60th Anniversary of the Parish of St Francis of Assisi, Maida Vale. The year was celebrated with a number of events, including a hugely successful P & F School Fair, a student’s Art Exhibition and a mosaic pathway. We look forward to the future, as we continue to build a strong educational community, that values faith and compassion, “Under God’s Protection”. Matthew Gibney was born in November 1835 at Killeshandra, Cavan, Ireland, son of Michael Gibney, a farmer, and his wife Alice. He studied for the priesthood and was ordained in 1863. He arrived in Perth later that year. Gibney had a kindly personality and plenty of drive and in 1873 he was appointed vicar-general to Bishop Martin Griver. He had a large physique and massive shoulders and his energy gave rise to many legends: his resilience when riding for days without water; his swimming flooded rivers to administer the sacraments; almost dying from arsenic poisoning when a farmer’s wife mistook it for carbonate of soda. In 1868 Gibney had opened the Catholic Girls’ Orphanage in Perth and in 1871 the Clontarf Orphanage for Catholic boys at Subiaco. As a result of damage to the boys’ orphanage, he set off for the eastern colonies to collect funds for rebuilding. On 28 June 1880, while travelling by train from Benalla to Albury, he learned that Ned Kelly’s gang had been surrounded at Mrs Ann Jones’s Glenrowan hotel and were shooting it out with police. Gibney left his train and tended the seemingly seriously wounded Kelly, heard his confession and gave him the last rites. Although advised against it by the bushranger, Gibney entered the now burning hotel to minister to the remainder of the gang, only to find their dead bodies; Martin Cherry received the last rites from Gibney before he too died. The priest returned to Perth in a blaze of glory. In November 1886 November Griver died, and next year Gibney became bishop. During his time, the diocese increased from 12 churches, 11 primary schools, 2 orphanages and 3 superior schools, to 31 churches, 43 primary schools, 2 orphanages, 21 superior schools, 1 college, a wayward women’s asylum, 2 hospitals and a monastery. 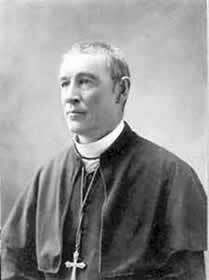 In 1898 he divided the diocese and created the diocese of Geraldton. Gibney stalwartly defended the Aboriginals in the North-West. He had first gone there in 1878, admired their culture and was horrified at their treatment by white pearlers. By 1890 he secured from the government, land at Beagle Bay and missionaries from the Trappist Order, whom he accompanied and helped to settle in. In 1900, with Canon Martelli and Daisy Bates, he went back to the mission and, in his mid-sixties, dug, hoed and cleared paddocks. On 14 May he resigned as Bishop, and Father Patrick Clune succeeded him. Matthew Gibney died at his North Perth home from cancer on 22 June 1925. He was buried in the Cathedral of the Immaculate Conception, Perth. Catholic Education in Western Australia is indebted to Matthew Gibney for his faith, hard work, dedication, great vision and determination.